Saturday was mild and rainy. The American Robins were out in full force. They were getting a shower and bath all at once. 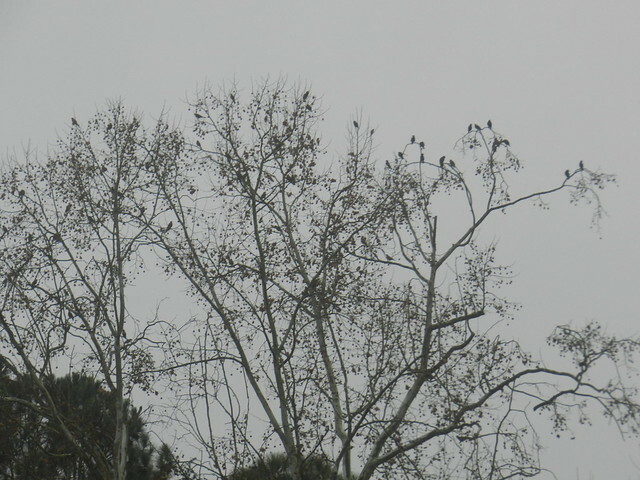 Flocks of birds were swarming into the bare trees. The last of the leaves were blown off by the wind and rain. 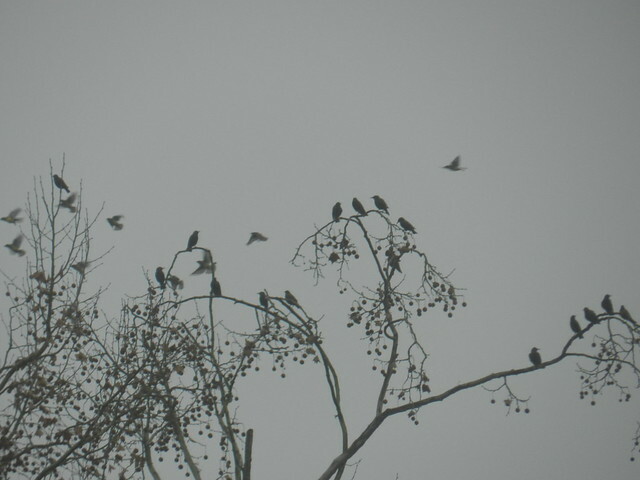 I don't see how birds maneuver without running into each other when they swarm into a tree together. 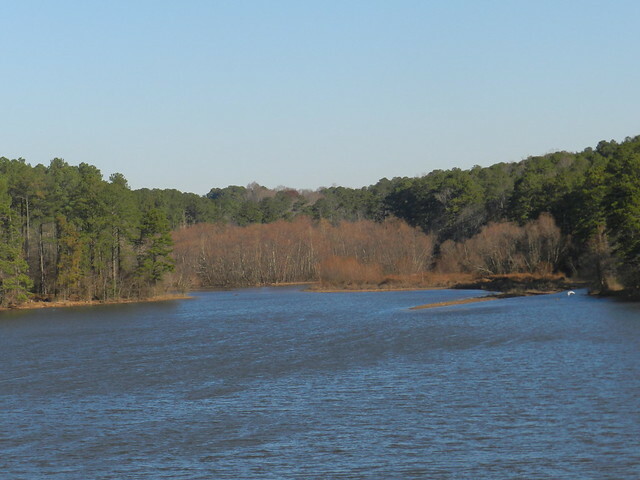 A perfect day for walking at the lake. The evergreens keep some year round color going around the lake. 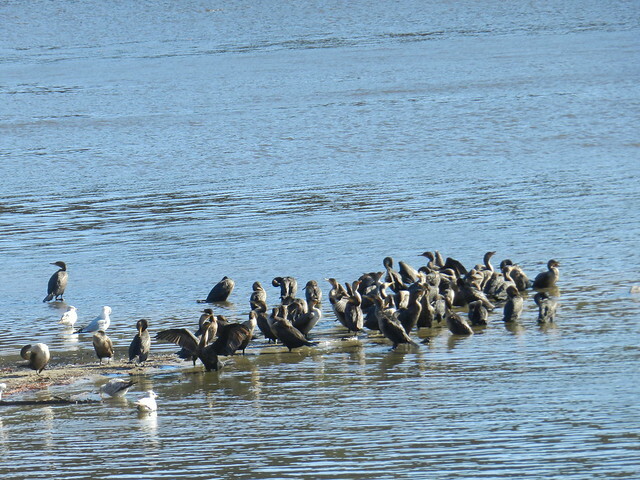 There were still a lot more cormorants at the lake than I'm used to seeing any time of the year. 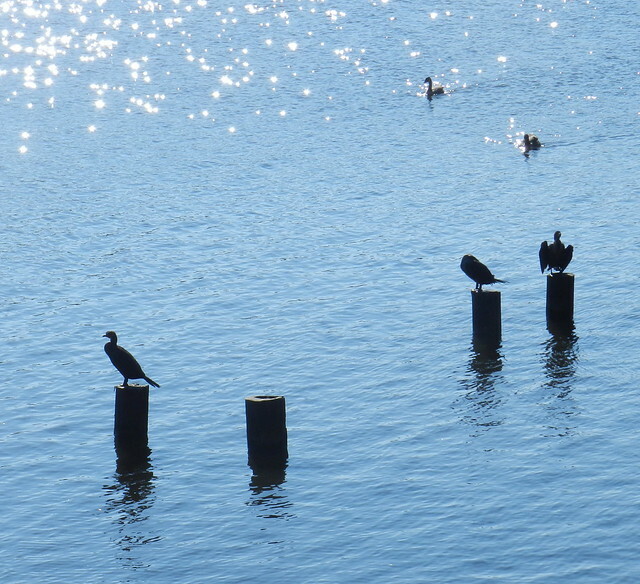 As I mentioned last week, usually I only see cormorants on the pilings (five or six at most) in the fall and winter and then they disappear in the summer. 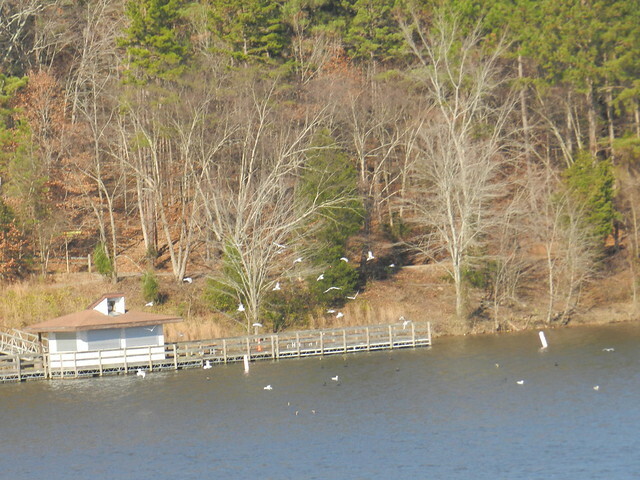 The gulls are the same in terms of leaving in the summer and returning in the fall but the cormorants are almost outnumbering the gulls this year. 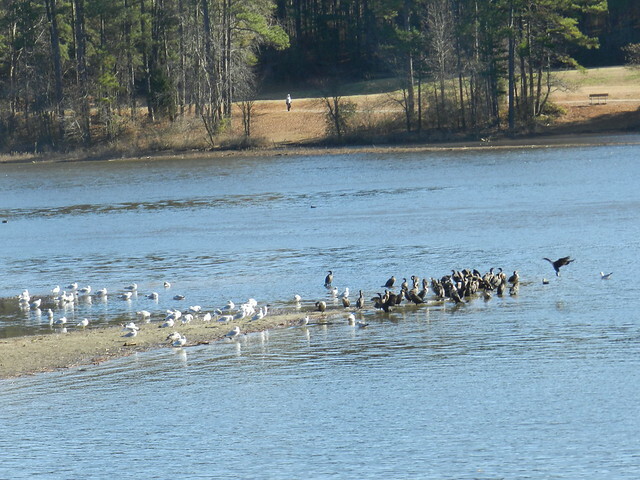 There aren't as many canada geese or mallards at the lake as I'm used to. 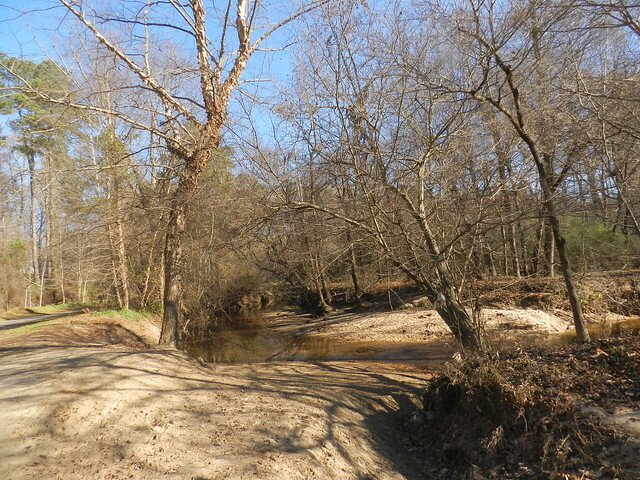 Click for nature notes and, or click here for Our World Tuesday. 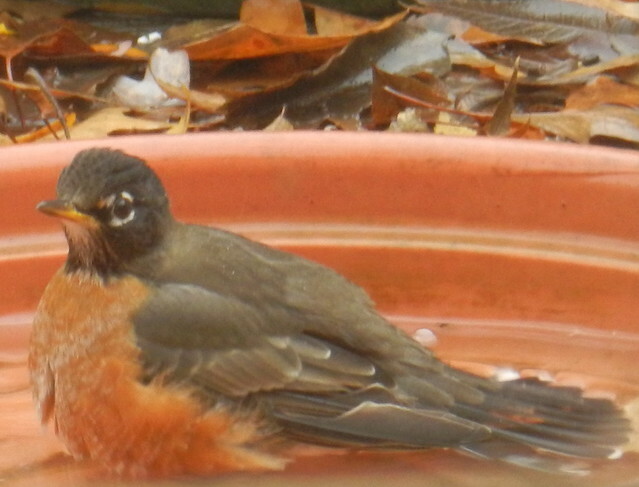 The robins taking a bath are so funny! 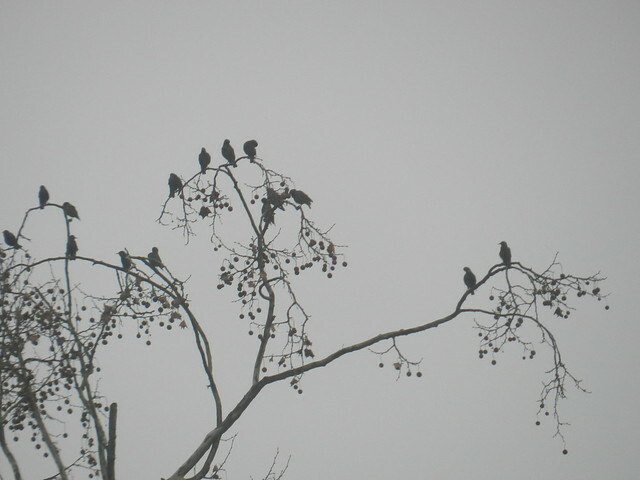 You got lots of cool bird photos, and I like the silhouettes of the trees and birds against the grey skies. I have noticed that about birds … their synchronicity is perfection. It is as if they have invisible highways and flashing lights signaling in their heads to prevent collisions in the air. there is always something to enjoy by the lake year round. i wonder if your neighbor's cats don't spook the robins off your deck. Love the "bird tree". I wonder that same thing about them . Swarms of birds almost act as if they share the same brain or something -- they never seem to run into each other. Oh, yes, I was thinking the same as the others regarding the "bird tree"! They are social little ones aren't they!! Wonderful captures for the day as always, Carver!! Thanks for sharing! I wonder if "my" robins came to visit you? I always like walks at your lake. Great pics. 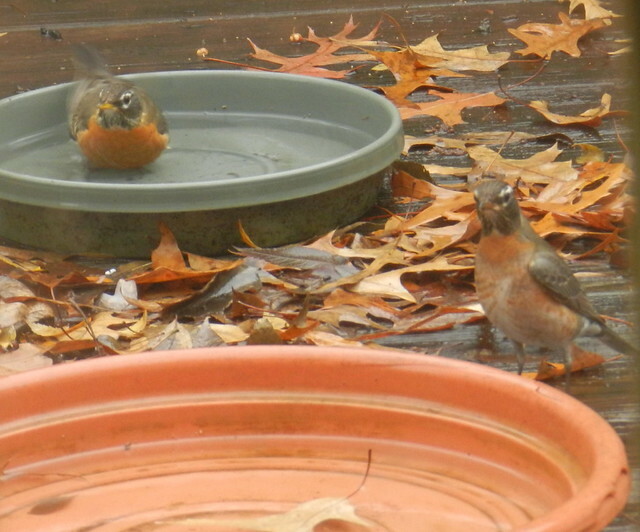 I especially liked the bathing robins. 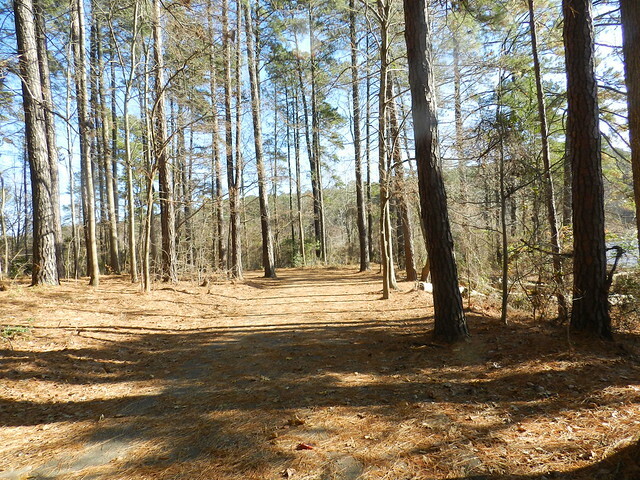 Beautiful nature shots and love the robins! Those Robins are just so cute. Those robins are so pretty! Lovely photos. The robins are adorable. I always enjoy the birds at your bird bath.. Cute Robins! The views of the lake are pretty. Great post, enjoy your day! Lovely bird shots! I just love robins. That lake looks a wonderful place for a walk. What a splendid walk you took us on. A beautiful series of photographs. 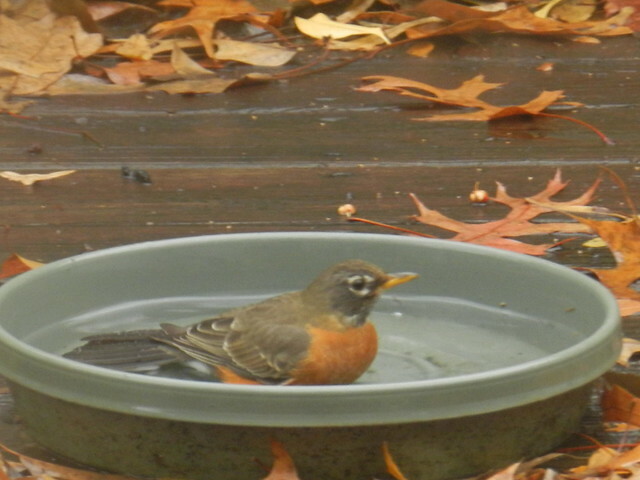 Love the robins getting their bath. Oh yes, I am with Michelle. The Robins are mine! your winter looks like our autumn. lovely to see your birds, we have so few now.